Today has been a relatively quiet day on the trek, according to the reports I’ve seen and messages I’ve received. Note that I’m reporting all of this from Colorado and I’m not in Nepal. Again, no one is climbing Everest from either side quite yet. Look for the first teams to enter the Icefall after April 10th. Many teams will be acclimatizing on Lobuche East, nearly 20,000-feet, to eliminate one trip through the Icefall. And those climbing from Tibet have not even left home yet! The volunteer Doctors who will staff Everest ER on the Nepal side are on their trek. This organization provides a great service to the locals including porters and Sherpas in addition to foreign climbers who are asked to pay a nominal fee of $100 for the season. Quite the bargain for a qualified and quality service. Yesterday was a big day but in hindsight, the Namche Hill was nothing more than a hill! That said, today is what is commonly called an “active rest day.” You will have many of these unless you are really sick because its best to spend a few hours each day doing something to keep the cardiovascular system going and muscles loose. Namche has all sorts of luxuries – a lot has changed over the years. A private bedroom with an “en-suite” bathroom, including a shower and even electric blankets for your bed is now available. Oh and yes, hot water! Internet is always available. In many ways Namche offers a better level of service than Kathmandu. The village has amazing coffee shops with every combination of coffee drinks you can think of, and some Starbucks has never imagined. Many have banks of power outlets to charge your phone, and satellite TV with the soccer/football game on. You won’t admit it, but you visited many of these establishments yesterday, even after complaining about the Namche Hill. Yes, Namche has come into the 22nd Century :). But to not give the wrong impression, there are many rooms available for reasonable prices … without electric blankets! The morning starts with the baritone sound of horns and chanting from the monastery in Namche. Now this is an alarm clock! You have eggs and toast for breakfast, while some on your team opt for porridge. Your guide makes the call for all to be outside the door at 8:30 for a trip to the Everest View Hotel … a classic. With your daypack on your shoulder, hiking boots on and a light down jacket, this is a day you have heard about and are anxious to experience for yourself. 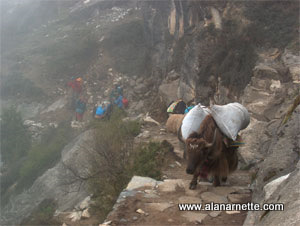 Leaving the lodge, you take a steep dirt path ever higher that soon offers an amazing panoramic view of Namche. To think this has been built by hand deserves admiration for the strength and skills of these people. All of a sudden four children, under the age of 10, run by you on their way to school. Then you dodge a couple of yaks headed into town. On my, you thought you were in the boonies but actually you are the one out of place. The path to the Everest View Hotel is steep. OK, now your credibility is shot because every time you go uphill, you called it steep but this time is different – you swear! The dirt path is filled with climbers and trekkers all with the same goal – to see Everest, Lhotse and Nuptse. You join the conga line and relax enjoying the amazing views that surround this Himalayan village. Ever higher and then the trail flattens onto what could be described as tundra but is really just grass. The trail continues higher past another lodge that never seems to have any business and then you turn left and there it is …. In full view lies Mt. Everest, Lhotse and Nuptse – the horseshoe of mountains that define mountains views. Today the wind is well behaved on the summit, only a slight plume. You have been blessed to have no cloud that would block your view. You pull out your camera and take at least 10, no 20 well OK 30 shots hoping at least one will capture this moment. To see the highest peak on earth, unobstructed, in full view is why you came as a trekker. As a climber, you pause, stare and step aside to have a moment. Yes, she is high. Yes, she is windy. Yes, she is more than you ever imagined back home. And yes, this is your goal … if you are up to it. The team continues their trek to the Everest View Hotel. Built for the Japanese in 1971, it’s perched on a ridge at 3880-meters/12,730-feet. In the beginning it was popular to helicopter to the hotel and spend a few nights in the rarified air, but there was one problem, the guest got very, very sick due to the altitude. Today, there is supplemental oxygen in each of the 12 rooms and of course, electric blankets and wifi! Your team meanders along the dirt trail tripping over the smallest rock because their view is captured by Ama Dablam, and more. Soon the Hotel comes into view, about an hour from your lodge in Namche. You climb the steps to the hotel lobby and are ushered to the verandah where your objective lies in wait. Stepping through the doors and onto the patio, once again its sensory overload in the Himalaya, as your gaze is laser focused on the sight to the North: Everest, Lhotse and Nuptse. Often overlooked are the other peaks including Thamserku, and Tabuche. You maneuver for a seat next to the rock wall at the edge of the patio as a polite waiter approaches you. “Um, coffee, tea, yes. Anything.” He actually understands walking away only to bring back your beverage in a moment. This is a moment in life. For those who have been to the Everest View Hotel many times (I’ve been there 9 times), you might be a bit jaded with all the people, the “ohs and has” and the sight itself. I hope I never get to the point in life that a view like this is taken for granted. It’s a gift each time. This is a time of imagination and letting all boundaries go. It’s a time of unlimited what-ifs, of the deep dreams inside and the wonderment of imagination. To edit now is a limitation of the human spirit. Absolutely love the narrative. Awesome to read and then be able to picture it all your mind. Thank you for the time you take to bring all these beautiful mountain experiences to us in the “outside” world. Much appreciated. Thank you for taking us there again! I appreciate your posts Alan. My husband Richard Cost is on the Madison Mountaineering team. It is nice to see through your posts what he is seeing with his eyes. Thanks Stacy. My best to Richard!